We are collecting email addresses to create an electronic mailing list for meeting announcements. The cost of printing and mailing newsletters has become prohibitively expensive, so we are migrating to electronic delivery. The list will not be used to send information other than meeting-related announcements. If you didn't provide your email at the meeting and would like to be added to the list, please send your email address to Shannon Mueller at scmueller@ucanr.edu and I will add you. It was wonderful to have such great attendance at the field day. 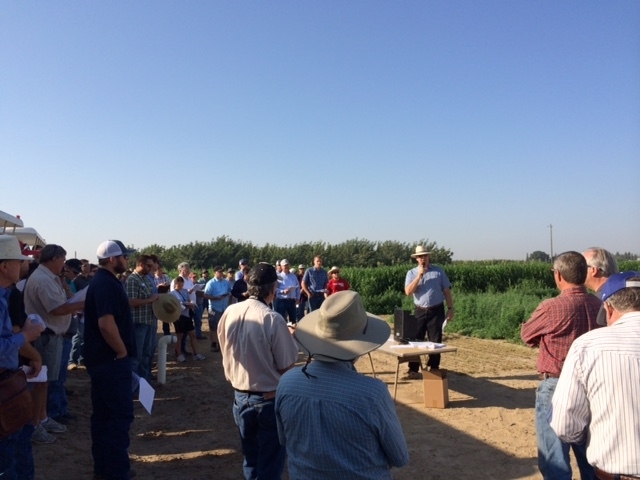 We look forward to seeing many of you at the annual California Alfalfa, Forage, and Grains Symposium in Long Beach on December 10-12. The handouts are very handy. I am told that buried drip in not all that popular where there are critters that like to cut the drip lines. I am pleased to find the Wheat following alfalfa hasa good benifit effect. I just stumbled upon this rotation, and fell into this rotation.